Social media has become a necessary strategy for all businesses irrespective of the industry they are in to boost sales and increase brand presence. No wonder, nearly all businesses are today turning towards social media to reap the benefits of its huge customer base. It provides a cost effective method to increase traffic and and reach a larger chunk of target audience. Moreover, there is one more thing that businesses should give serious thought to is promotional products. It too can be coupled with social media marketing to generate more traffic and reach wider target audience. Both the products provide a cost-effective approach, reach new customers and generate the brand exposure it deserves. But if they can be made to work together the benefits obtained will be manifold. If you are planning to create promo items on your own, you can implement inkXE designer tool. Every information shared on social media by businesses are meant for one thing only and that is ‘engagement.’ Businesses expect their target customers to engage with their social media posts be it in the form of post share, post likes, comments, mentions etc. The motto is to capture a user’s attention. On the other hand, the fact is, most businesses find it tough to manage and get the results they want. This is where promotional products come in handy. If businesses can offer a small gift to invite users to engage in the company social media page, it would be of a great benefit to the companies. It is a small price to pay, compared to what businesses will achieve. 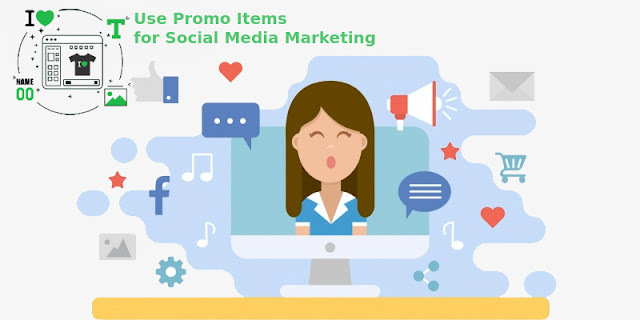 Businesses can employ promo items for page likes, post shares, garner name and email IDs as well. On the other hand, this may invite users to encourage other to engage as well. Companies can implement this strategy for email newsletter sign up as well. Eventually it will lead to word-of-mouth marketing. Promo items are a great way to reward your active customers and show your appreciation to them. Businesses can also employ this to show appreciation to customers in social media who have shared their positive experience with the products or services. When you keep your online customers happy, they are more likely to endorse your brand on social media, which will in turn increase conversion. Businesses can send out their promotional products to their new followers as a token of thanks. They should also send out gifts who share positive feedback about the business. Show your gratitude to those who help create your positive brand image. Companies believe that the best form of marketing is the word-of-mouth marketing and businesses would definitely want their customers to actively discuss about the brand. But, to have that businesses need more than just a good product or a good service. To encourage customers to have conversations, businesses would have to go the extra mile by sending out gifts especially the ones that are trending in the pop culture. Trending products will automatically create a word-of-mouth marketing that the businesses crave for. Send Facebook and Twitter users some gifts for liking or following your page. Send appreciation when they share their email id and mailing address. If you have a physical store, it would be great if you could ask your followers to stop by your store and pick up a free gift in exchange of some information. Ask your promo item receivers to post a photo of them using the promo product. This way, you will garner more engagement from customers, at the same time provide a proof of your giveaway campaign. You create a buzz in your niche market by printing promotional products along with twitter handles, QR codes and hashtags. This way, businesses can direct more customers to the website and social media channels.